O K...I'll go out on a limb and expose my 25 yard set up. And ask what you think. I have no way to build a berm so I have stacked railroad ties and backed them with old tires filled with dirt. I have two T-posts on either end of the ties and stainless wire strung between them to hang targets on just 6 to 8 inches in front of the ties. 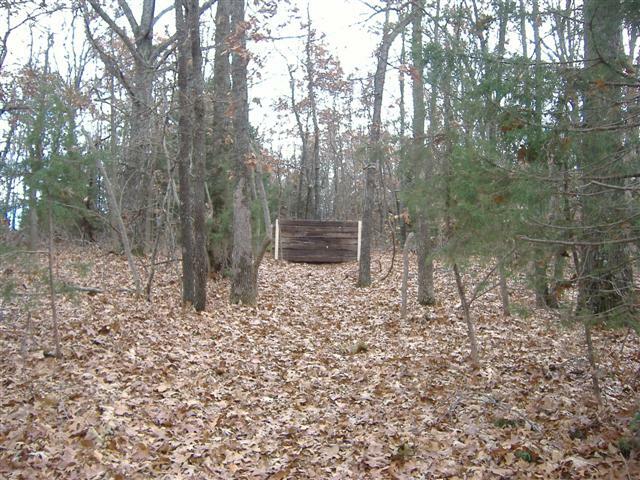 It is about 300 to 400 yards to the end of my property and it's all covered with oak, hickory and walnut forest. The range is about 2* up grade and the grade continues for at least 100 yards past the back stop. 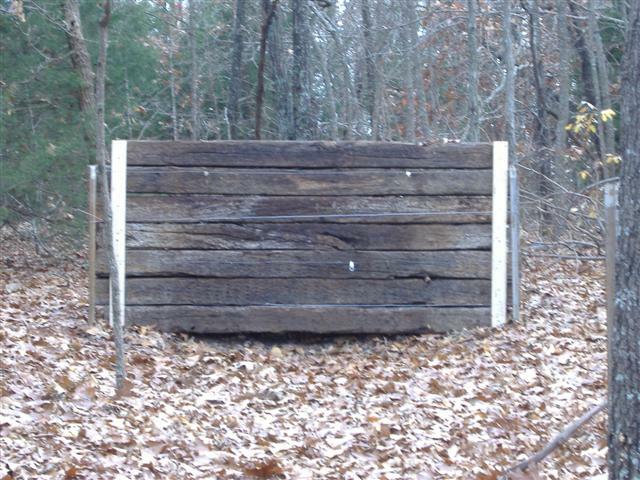 I have a few signs posted stating that they are crossing the down range part of a live pistol range. No homes down range for a couple of miles. Bushy, looks good to me. And your very fortunate to have something. You are lucky to have big enough property for a target range at home ..
My pistol club do something similar, but instead of using timber we uses sand piled front of the tires. The guy who design it reckon that timber may bounce very slow target projectile back to the shooter, where sand would give and absorb the energy of the projectile. Looks like a good backstop Bushy. The older and softer the ties are the better. I'm using old telephone pole sections with a dirt backing, about 6ft of dirt. Even though you put up signs you are still responsible for the bullet that does damage somewhere or to someone even if on your property. You have an open land situation where if people can wander on your land then the signs are of little value i.e. the range is not completely on the curtilage of your home. Still you have done about all you can do without hauling more dirt in and create a taller berm behind the targets. We had a similar situation at our gun club. A guest fired off a shot at something on top of a 20' berm and the shot carried on to a sanitation collection station. Nice clean hole in the building that belonged to the county. That building was right at 2 miles from the berm. We had to come up with a plan and mandatory training to satisfy the county or they were going to shut us down. Our plan was approved by the county and no one fires on the range unless they attend one of our safety training sessions. Just continue to be the responsible shooter you are on your range and you won't have any problems as long as you keep your shots in the backstop. No one shoots on my range unless I'm there. And targets are kept on the second wire from the bottom. The top wire is reserved for B-27 targets and 7 to 8 yards distance and no head shots. Looks good to me Bushy, although personally I would prefer a bit more height and/or a bullet deflector on top and at the wings. As Chris said, anything and everything you can do to make it safer is definitely in your favour, especially where liability is concerned. All this talk of using auto tyres worries me. Some years back the Aussie Defence Dept decided that because of ricochets coming off the tyre stop butts on their ranges that ALL tyres were to be removed, a 10m high concrete wall lined with 4 inch thick timber planks put in place then sand put in fron of the wall for the bullet trap. Even 7.62mm NATO rounds were bouncing off the steel belt tyres...very nasty. I'm sure my wife wished that my backstop looked so neat. Mine consists of tree trunks stacked as tightly as possible making a stop 8 feet wide X 7 feet high. It runs just over 12 feet deep and keeps growing as I clear the old pine trees that die. It does a very good job of stopping anything I will ever shoot into it, but I have to admit that it is a bit of an eyesore, though she is trying to get ivy to grow over it as camo. Ya know, when you get old, [Bushy??? ] the eyes are the second thing to go. Looks good enough to me. The best railroad ties are the oak and another type of wood that I think is sweet gum or bois d'arc (pronounced BO-dark..... also known as Osage). If you can hardly lift them, that's the right ones. You can probably shoot through some pine ties, but it hard to shoot through these, unless you have a cannon. But even if you do, the bullet isn't going very far.